The Scout Cat Tree by MidWest Homes for Pets is part of the Fine (& Fun) Feline Furniture collection. The Scout features beautiful all natural woven rattan, a spacious dome cubby with faux fur pillow, comfortable basket bed and sturdy sisal wrapped supports. 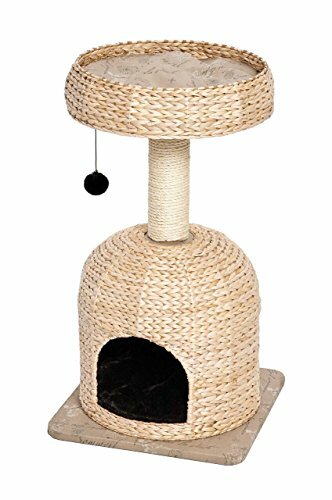 The Scout Cat Tree will look great in your home and provide your Cat with a place to play, rest and exercise. Measures 18"L x 17.6"W x 31.5"H.
100% Natural Wool MEDIUM Cat Cave - Handmade Premium Shaped Felt - Makes Great Covered Cat House and Bed for Kitty. For Indoor Cozy Hideaway. Medium Size Pod Soft Hooded Bed Area.